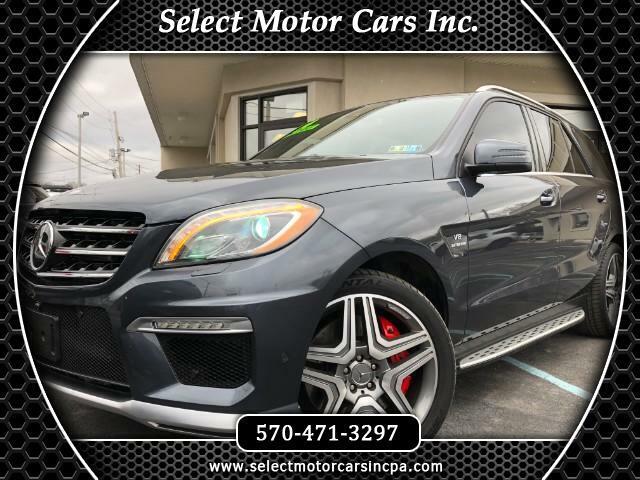 Used 2014 Mercedes-Benz M-Class ML63 AMG for Sale in Moosic PA 18507 Select Motor Cars Inc.
1 OWNER RARE FIND ML63 AMG 4MATIC AWD V8 BITURBO LOADED RECENT SERVICE W/RECORDS $109,000 MSRP! 1 Owner 2014 Mercedes ML63 AMG 4Matuc AWD in gorgeous Steel Grey Metallic exterior with Black Designo interior. Features include 5.5L Biturbo charged 550HP engine,automatic transmission,4Matic All Wheel Drive,AMG Performance Package, LED daytime running lights, adaptive xenon headlamps,LED tail lamps,front & rear park distance control,Driver assistance package,dual power heated mirrors,power fold mirrors,power close trunk,chrome roof racks,keyless access system,distronic plus adaptive cruise control w/presafe brake assist,running boards,dual exhaust,red brake calipers,21" AMG wheels,Designo premium Nappa leather seating, AMG performance steering wheel with Dinamica grips,steering wheel controls, steering wheel paddle shifters,carbon fiber engine cover,blind spot assist,lane keep assist,Designo Piano black lacquer wood trim,airmatic air suspension,adaptive damping system,active curve system,Harmon Kardon sound, CD,bluetooth connectivity,surround view camera,backup camera,adaptive highbeam assist,active parking assist,front heated & ventilated seats,mbrace2 w/mb apps,power sunroof,attention assist,collision prevention assist,dual zone climate control,keyless go,homelink,satellite radio,auxiliary input,cupholder cooler,ambient lighting,auto dimming mirrors,memory package,weathertech all weather floor mats,center console,cupholders,amongst many other great features. Recent 55K service done at Mercedes,new continental tires,new Mercedes front & rear Rotors & pads. Over $109,000 MSRP!